Gallery of Borders where I crossed. The west end of Dutch border is wetland area facing to North Sea. 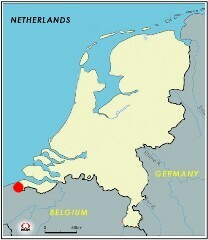 (Upper left)The westernmost point of the Netherlands is located beside of Belgian Restaurant. The parking area seems to be in Dutch territory. (Lower left) Dutch signpost at the entrance of a Dutch town, Sint Anna ter Muiden. (Upper left)Dreef, the Belgian Northernmost town. (Upper right)The Northernmost area of the town. (upper)EMU crossing border. The white post shows the terminal of Dutch Railway and the origin of the Belgian Railway. (Upper left)Niewstraat/Neustrasse in Kerkrade. Left is Dutch and Right is German territory. (Upper right)Previously, vehicle traffic was blocked to cross the border line.